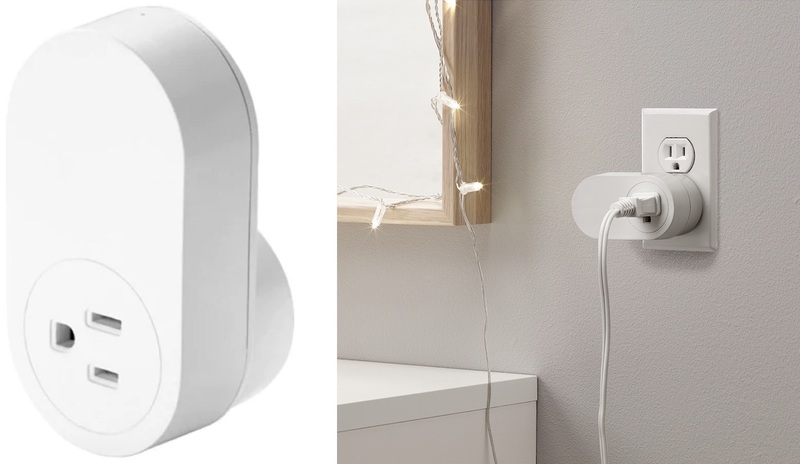 Ikea's much-anticipated Trådfri smart outlets are now available for purchase in both the UK and the United States, providing a super affordable soon-to-be HomeKit-compatible smart plug solution for those who want to take advantage of HomeKit without spending a lot of money. The Trådfri smart plug can be purchased for just $9.99 (or GBP9.99 in the UK), which is much cheaper than other HomeKit-enabled smart plug options on the market. Unfortunately, while HomeKit support is in the works for the Trådfri smart plug, it isn't available just yet. An Ikea employee on the Trådfri team said yesterday on Reddit that HomeKit integration wasn't able to be implemented ahead of when the smart plug was released. HomeKit support is in the works, however, and in the meantime, the smart plug can be controlled via the Trådfri app. Using the Trådfri smart plug requires the $30 Trådfri Gateway. The Gateway is needed for all of Ikea's affordable smart home solutions, including light bulbs, dimmers, motion sensors, and more. There's no word on when HomeKit support will be available for the Trådfri smart plug, but HomeKit was added for Trådfri smart lights connected to the gateway late last year. When HomeKit is available for the smart plug, the Trådfri system will be one of the cheapest ways to get a complete set of HomeKit products even with the expense and inconvenience of a hub. The Trådfri smart plug was spotted on the Ikea website back in early October, but as Pocket-lint points out, it did not become available for purchase until recently. I’ll wait till HomeKit is available. I’ve seen way too many broken promises from home accessory makers that intended to add HomeKit but didn’t. I may have an unpopular opinion here, but these companies need to keep quiet about HomeKit support until it’s ready for production release. Promising and then acting like it was never a thing (Ring) isn’t cool. I would love HomeKit support in every device and I KNOW it’s tough to implement but don’t get people’s hopes up (and take their money). While that’s true of many companies, I think IKEA’s been very good. I mean, for the price, they have fired ahead with more support than many competitors. Also HomeKit is already available for their lights so I doubt it will be long before it’s available for the plugs. I imagine by early January. Why does homekit seem to be so hard to implement? There are a million smart plugs on the market and like 2 are compatible. Perhaps Apple should reduce barriers to compatibility? For lights it makes sense to have a gateway/bridge if they're operating on their own network (ie. Philips Hue with ZigBee). I'm happy that my 50 Philips Hue lights and associated devices (motion sensors, etc) all form a mesh and talk to each other on their own network. They're not dependent on, nor do they clog up, my WiFi network. Gateways generally offer the benefit of lower cost per device. They don’t have to put Wi-Fi radios in every bulb, plug, etc., and can use lower cost and lower energy radios in the units. Bluetooth, zigbee and so on. Also means they can make stuff smaller. Seen the size of LIFX bulbs? Pros and cons to both. No you’re not, it’s very confusing. Google recently pushed out an update to the Google Home app and it’s bloody brilliant. That’s how Apple’s Home app should have been, not the weird mess it is right now.